Andrew Gulliford is a contributor to Writers on the Range, the opinion service of High Country News. He is a professor of history and environmental studies at Fort Lewis College, [email protected]. As spring returns to the Rockies, I think about a day last summer when we packed for a rafting trip, never thinking to pack for death. We took clothes, cameras, river gear, sleeping bags and tents. We never dreamed there might be a tragedy, a whitewater death by drowning. And yet that accident happened, and our lives were forever changed the instant the raft flipped. It took hours for a helicopter to come by, low and slow, searching for the kind of shadow that reveals where a body might be hidden underwater, pinned by boulders. Four other rafts were well ahead of us when our raft slammed into a submerged tree and the commercial river guide yelled, “High side! High side!” That meant we had to move fast to the upside of our raft to prevent water from getting into the low side and flipping us. But in a tight canyon with the river roaring at 9,000 cubic feet per second, everything happened simultaneously. The raft tossed all six of us into 45 degree water. I blew out the back end and swam to a log near an island. I looked around for my companions. I saw no one. 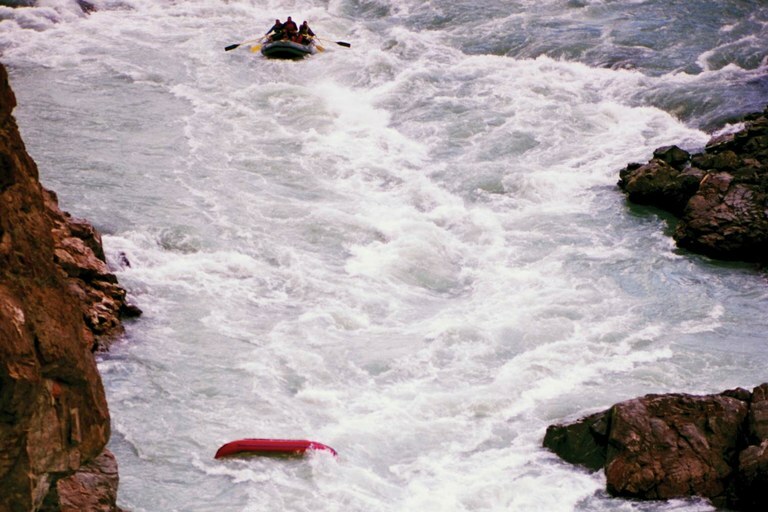 A capsized raft floats through whitewater. It was the first day and the first rapid on a four-day rafting trip. In those seconds after the accident, as I tried to understand what had happened, I heard only the rushing water. Then I saw the upside-down raft bobbing furiously in the river, caught in the kind of submerged tree that river-runners call a strainer. I stayed on the log, debating whether to try to get to the island, when our guide appeared out of the thick willows. He saw me and patted his head. I patted mine in turn to signal that I was OK. We couldn’t hear each other over the sound of the river. He turned around and melted back into the brush, and I stayed a few more minutes on the log, my impromptu sanctuary. In 20 years of river running, I’ve experienced plenty of flips, but this one felt different. I reached the island, removed my lifejacket and helmet and tried to dry off as the sun climbed the cliff. Then one of the couples who had been in the front of our raft appeared, both of them barefoot because the river had ripped their sandals off. We hugged. We explored the island. On both channels the river roared by too swiftly for us to make a safe exit. Then we saw two guides signaling to each other across the river about how many of us had been rescued. And that is when we knew: One of us was lost. River running, both in private boats and commercially, has become firmly established in the Rocky Mountain West. Families want a taste of adventure, cold water splashed on hot skin, yells and shouts of excitement, a reason to hang on to the “chicken line” as the rafts tumble through rapids. We crave excitement. Our group had planned this trip months in advance without knowing that a record snowpack would force the dam above us to release huge amounts of cold water, not only to save the dam but also for downstream irrigation. These pulse floods are healthy for the environment, re-establishing habitat for endangered fish and bird species. But with high flows, there is little margin for human error. Now, as the bright sunshine ebbed towards late afternoon shade, we survivors were grateful simply to be alive. The next hours blend together. I recall deep wails and sobs of grief from the man whose partner was missing. He kept saying, “Why her, God? Why not me? Take me, I’m older.” The inevitable questions arose about the random nature of death, who dies, and why. Weeks later, I thought about the hidden complexities of the situation. Here we were, trapped in a canyon, and yet also caught between some of the West’s other competing activities, things like farming and irrigation, activities far removed from river running. The Bureau of Reclamation, I had learned, would not slow a scheduled release from one of their big dams — not even to retrieve a body. There were 28 passengers on the trip, and among them were grandparents who’d brought their grandchildren. I hoped those children did not blame the river. We had chosen to be in the wilderness, and that choice had irrevocable consequences. Snow is melting now in the backcountry. Rivers will rise in June from snowmelt, and rafters will launch with a sense of nervous expectation. To every river runner and every excited passenger: I wish you safe passage.